Q1: What's this about? and what it could do? A: This is a Mini AM FM pocket radio with lightweight for the young and old, while walking, exercising or riding. And it is could be used easily with sturdy button, big digits and preset, convenient and clear for the young and the old. Q2: How to use it? Does it difficult for old and young? A: This digital pocket radio is easy to operate: Only designed with several simple buttons, easy to operate and control, it is also rather suitable for seniors and children. Q3: How many hours does it could be use? A: portable personal radio matches with 500mAh rechargeable Li-ion battery, 15 hours or more working time could meet most of your need. you don't need charge it again and again. 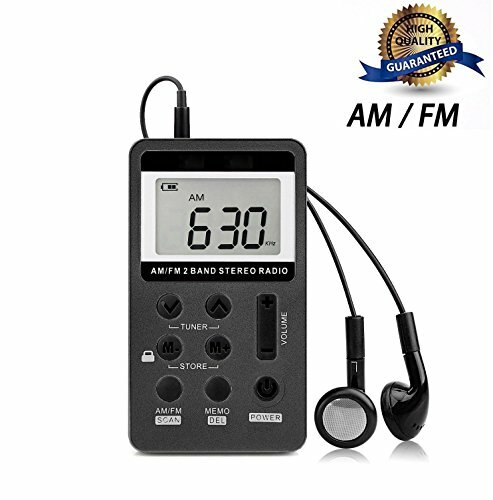 This mini stereo radio supports FM/AM 2 wavebands, 9/10KHz AM steps adjustable. Only designed with several simple buttons ,Very easy to operate , it is suitable for seniors and children. With 500mAh rechargeable battery (can be charged through regular USB cable ), Almost could work last for 15 hours or more , Can meet you need all the day . 500maH BATTERY: The radio with 500mAh rechargeable battery (can be charged through regular USB cable ), Almost could work last for 15 hours or more , Can meet you need all the day . Easy To Use : Very Simple to set , All buttons with clear label . And the radio with a sturdy hand rope , You can tie it in somewhere to avoid lost it . If you have any questions about this product by Noeeyi, contact us by completing and submitting the form below. If you are looking for a specif part number, please include it with your message.